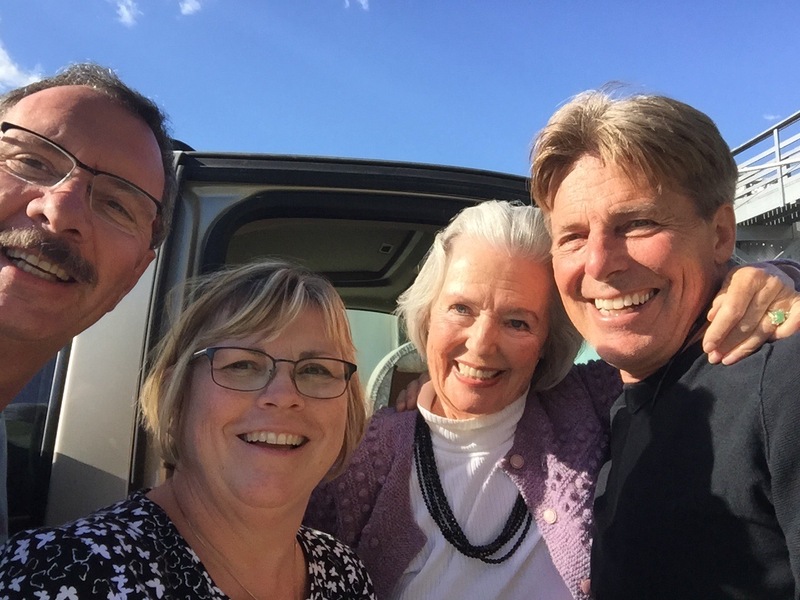 Back when we were planning our trip west, Diana asked her cousin Nancy if she and her husband David would be interested in meeting us in either Napa, Yosemite, or Oregon. The former worked out better (lodging-wise) for them, so our rendezvous dates of May 15th through the 19th were set! On our way north to Napa from Three Rivers, we spent the night at a Harvest Hosts location in Lodi; Jessie’s Grove Winery. Home to the oldest Zinfandel vines in the Lodi area, the land this winery is located on is a fifth generation ranch. We purchased a bottle of one of their old-vine Zinfandel wines, which was excellent. Here we are with current owners Wanda and her son Greg. We enjoyed listening to Wanda tell the story of how her great grandparents met. Joseph Spenker first saw Anna at a wedding and told her he would pick her up the next day, as he was going to marry her. True to his word, he came with his wagon while she was in the middle of doing laundry and off they went…tossing her wet clothes in the back. They were married before the sun set and raised two children on this farm, Jessie and Otto. Jessie was the glue that held the business together through Prohibition and The Great Depression; hence the name on the winery is hers. 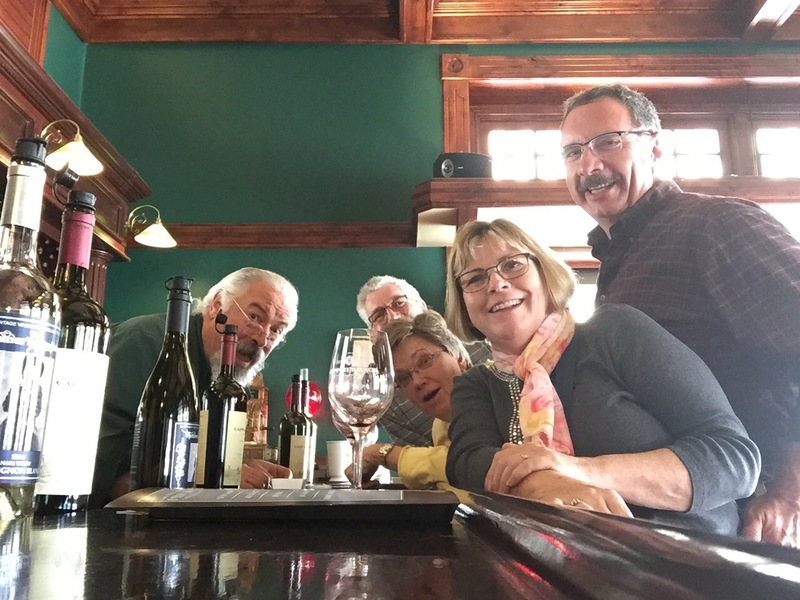 A delightful story from a charming woman that made for another wonderful Harvest Hosts stop…a ‘must’ if you are ever in Lodi. We arrived in Napa on Monday, May 15. After setting up, we spent the evening with Nancy and David. Over dinner and a bottle of wine, we plotted our next four days. We decided that we would alternate days of driving and planning, which ended up working out tremendously well! Tuesday was theirs to plan. 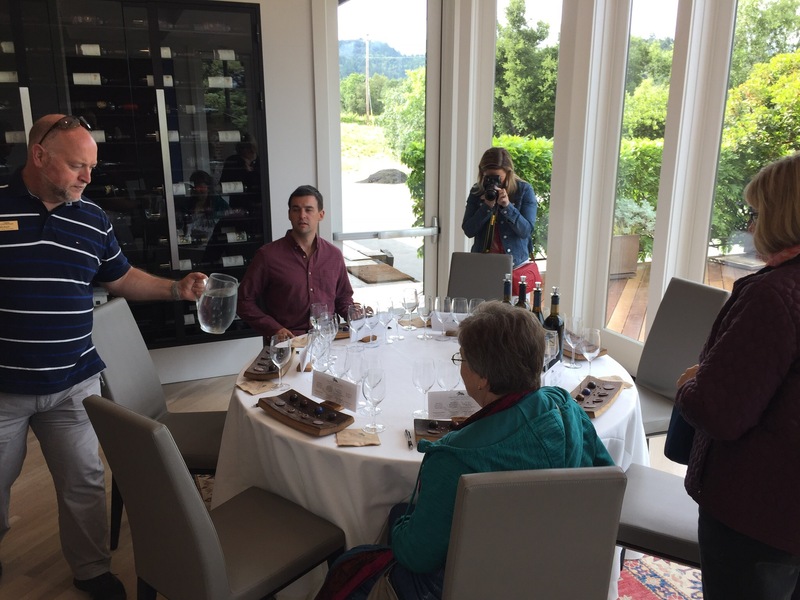 We started out in downtown Napa at Capp Heritage Vineyards’ tasting room. We spent darned near an hour with Gary going over some of their offerings. He was extremely entertaining! After lunch, we headed to The Hess Collection. Situated high on Mt. 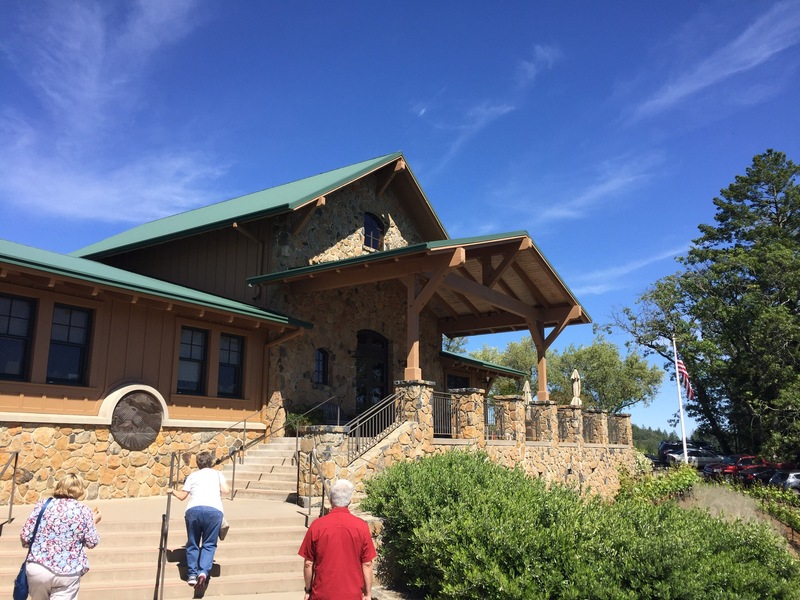 Veeder, this winery occupies the land and a wonderful old 1903 building that is leased from the Christian Brothers. 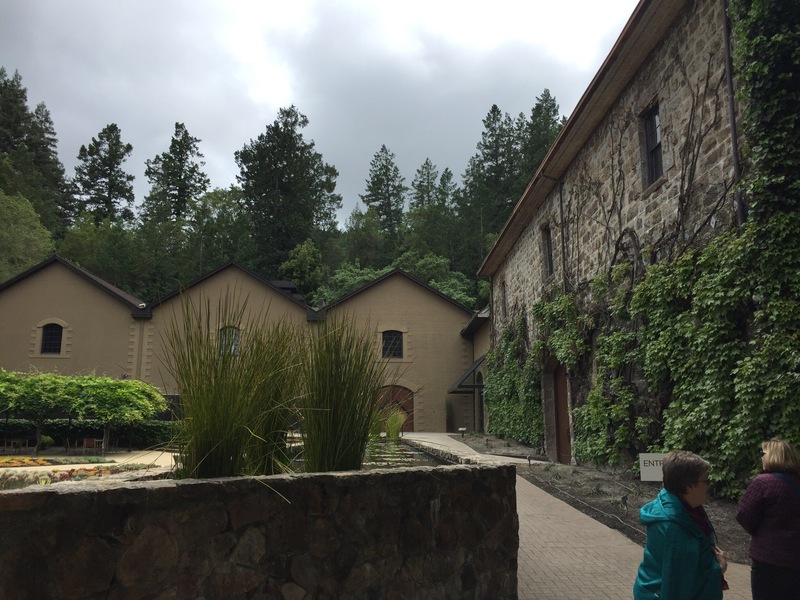 Several of the buildings on the property were damaged in a 2014 earthquake, along with thousands of gallons of wine being spilled into the courtyard. Renovations are still underway. We were part of a semi-private chocolate and wine pairing, which was coupled with a tour of Donald Hess’ collection of contemporary art. Our tour mates were Mike and Jenna from Boston. Jenna writes an excellent lifestyle blog called Boston Chic Party. We toured some of the old Christian Brothers vines, the barrel cellar, and then the art collection. 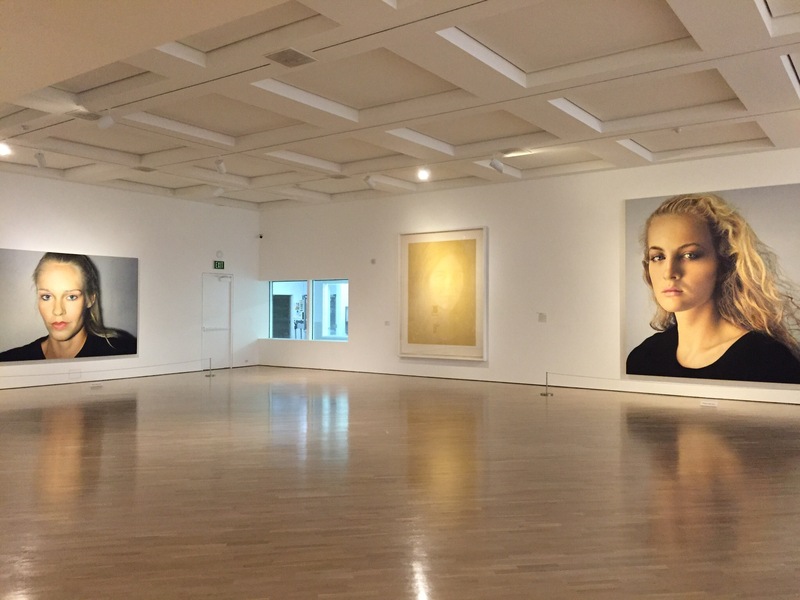 These two large images appeared to be photos, but are actually paintings! 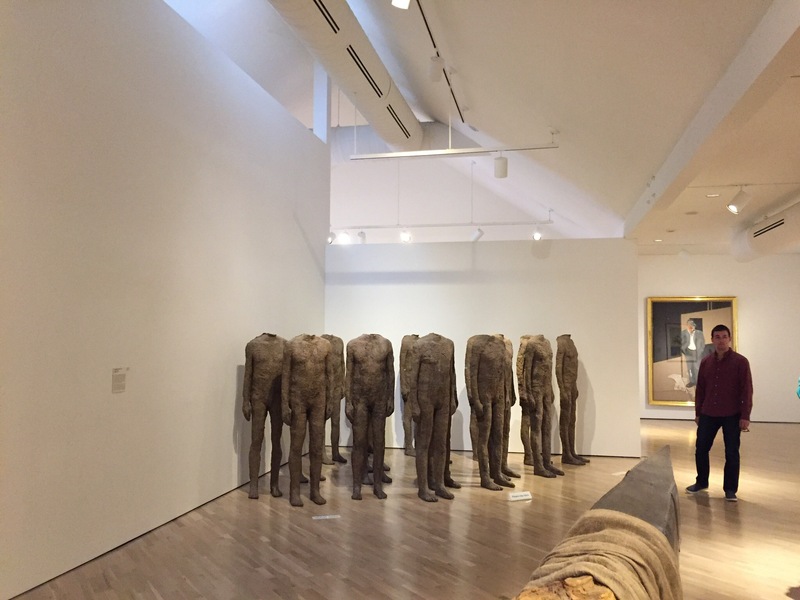 In this piece, the artist left off the heads… as she felt that when people are in a group, they don’t use them. 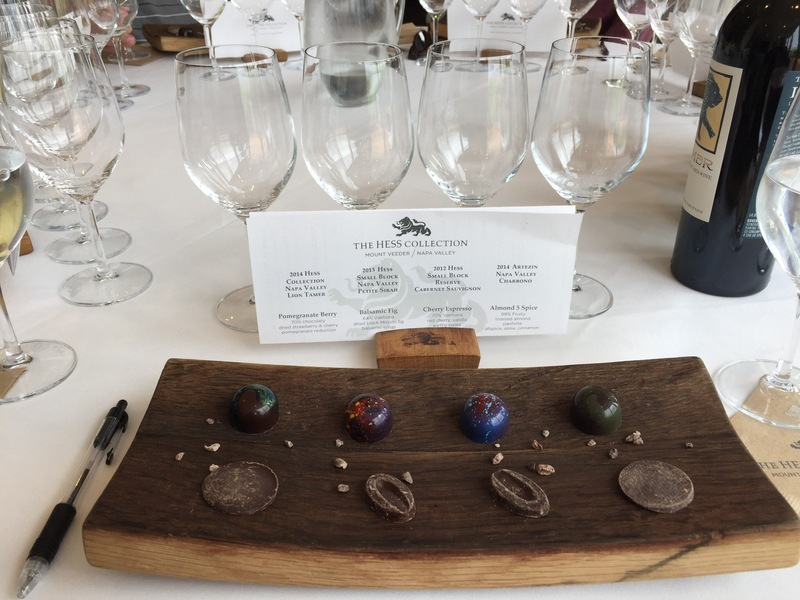 The tasting itself consisted of these handmade chocolate truffles that were paired with four wines. It was definitely first class! Wednesday, Diana and I took our turn and we all headed over to Santa Rosa. 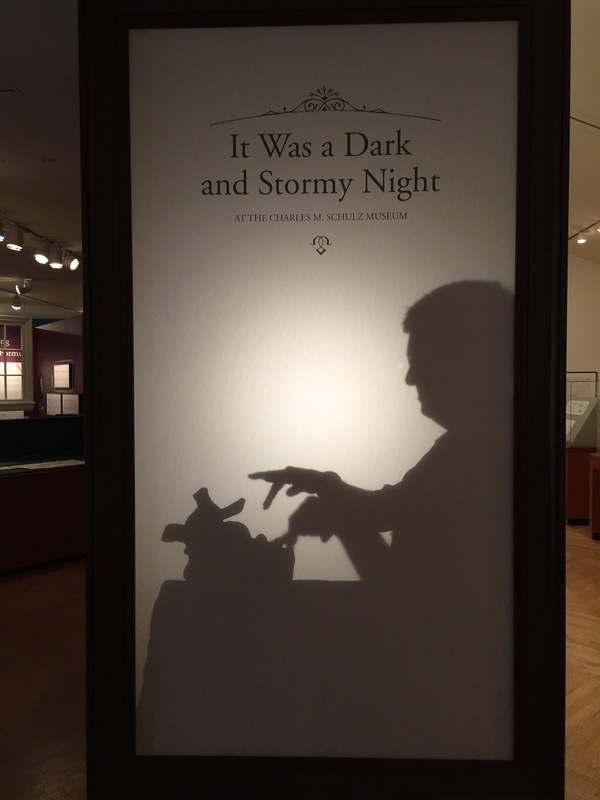 Our destinantion was the Charles Schultz Museum. 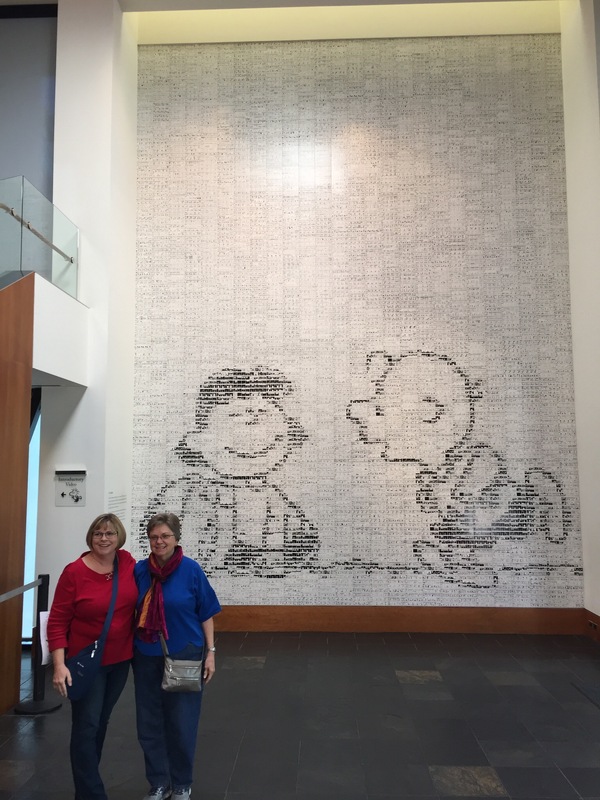 This giant mural is actually made up of hundreds of four panel Peanuts comic strips. 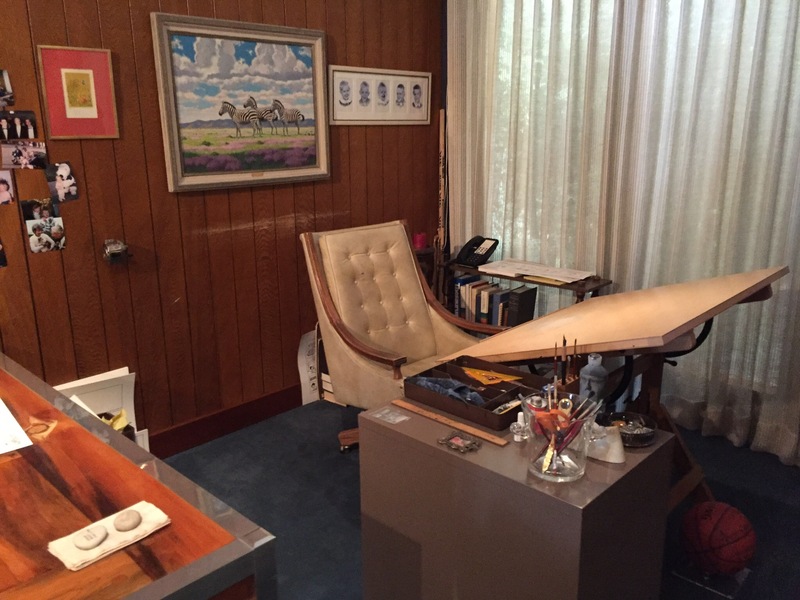 This is the studio where Charles Schultz composed his Charlie Brown cartoons we all loved so much. 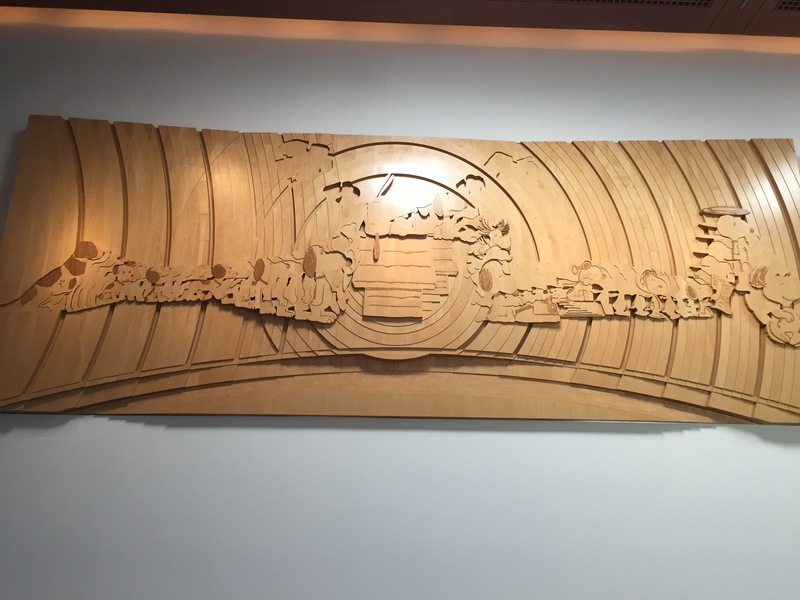 They also had this large sculpture showing the progression from young Charles’ actual dog Spike into the final version of Snoopy. 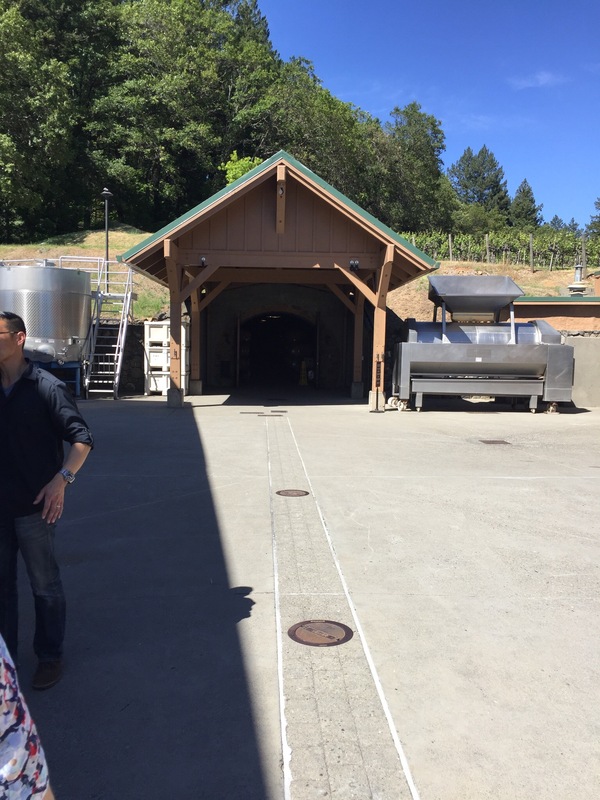 From Santa Rosa, we headed to Sonoma Valley and toured Benziger Family Winery. Diana and I actually took this tour back in 2005 and loved it. It was still as good as we remembered it to be. 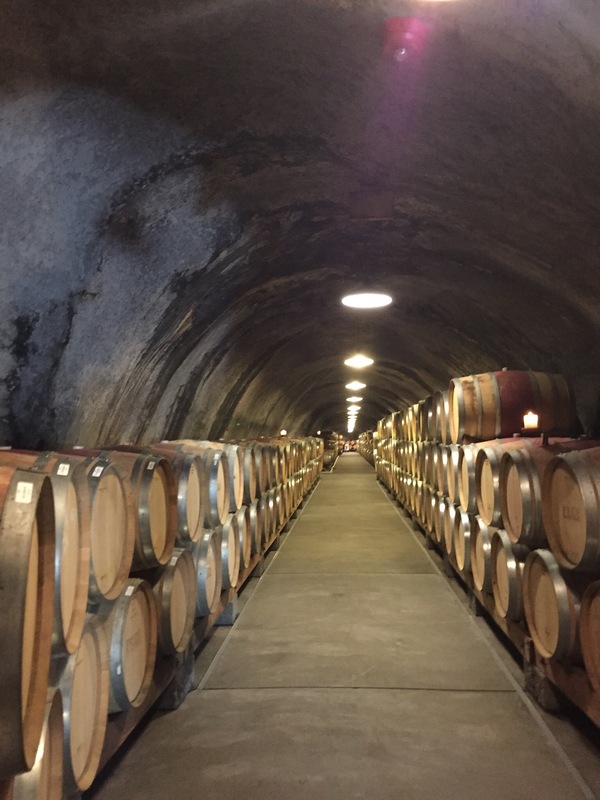 Thursday, David and Nancy took us on a cave tour at Failla Vineyards in Napa Valley. Their wines were elegant…which we translated to having a lighter taste to them. Definitely a nice tour! Our second and final wine tour of the week was a curvy trip to the top of Spring Mountain to Pride Mountain Vineyards. Their winery is housed in this picturesque timber frame structure. That brick inlay in the concrete is the Napa/Sonoma county line. It bisects their cave and creates an extra layer to their business, as the tax accountant has to figure what percentage of the product came from each county. 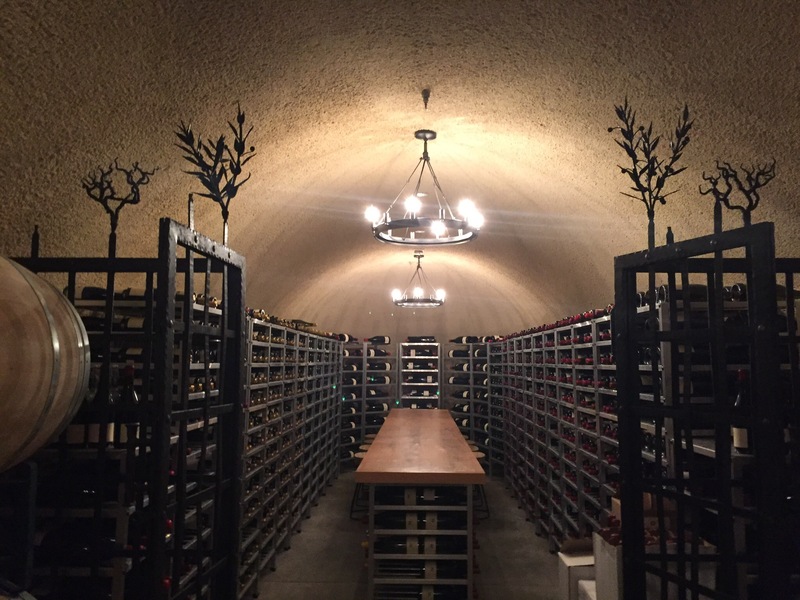 We explored the many arms of their cave, tasting different varietals along the way. Jay was our outstanding tour guide, who was a fountain of knowledge. 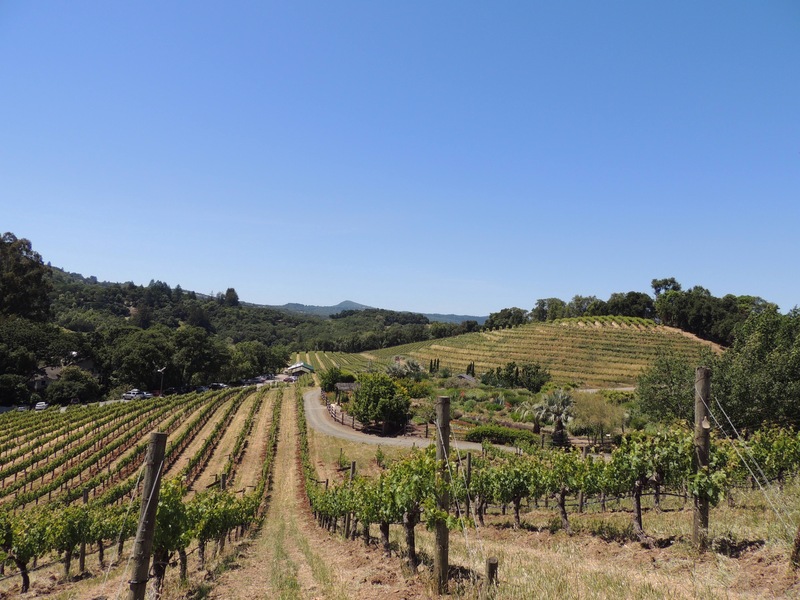 We were surprised to learn that Napa and Sonoma’s total production only accounts for 4% of all of California’s wine! Pride’s offerings were more robust. Definitely worth the winding trip up Spring Mountain! 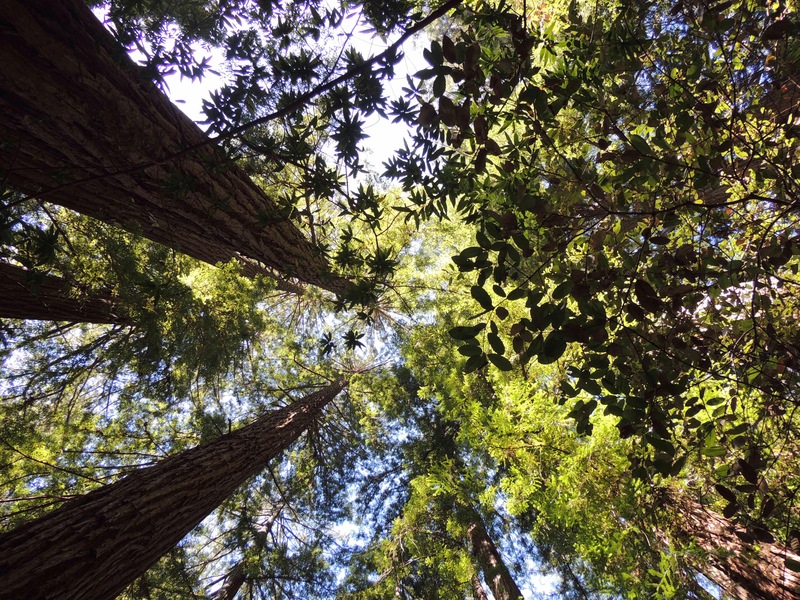 On Friday, we capped off our week with a trip to Muir Woods and Sausalito. The trees in Muir Woods were amazing, but we came away with the feeling that the place was being loved to death. The crush of tourists (including us) really distracted from the natural setting. There were upwards of six tour busses in the parking lot at any given time. 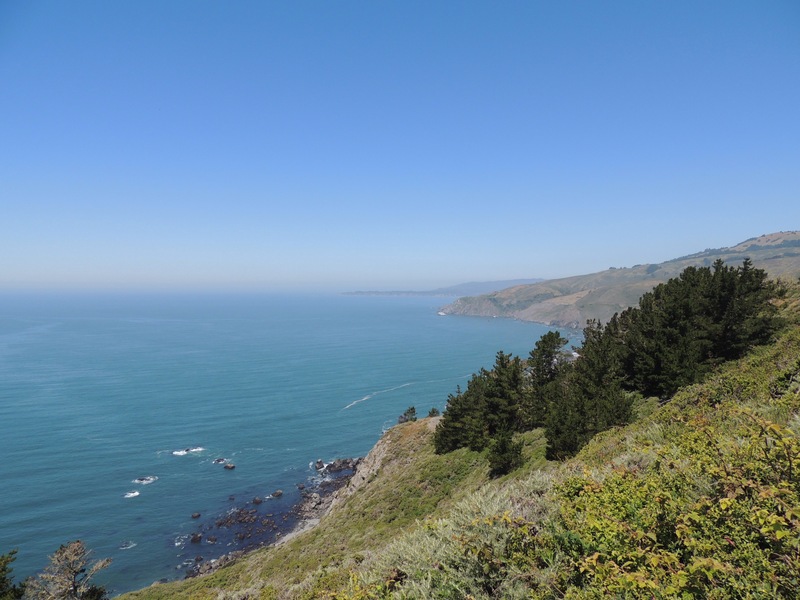 We did get out to the Muir Beach Overlook, which had a fantastic view over the Pacific Ocean. 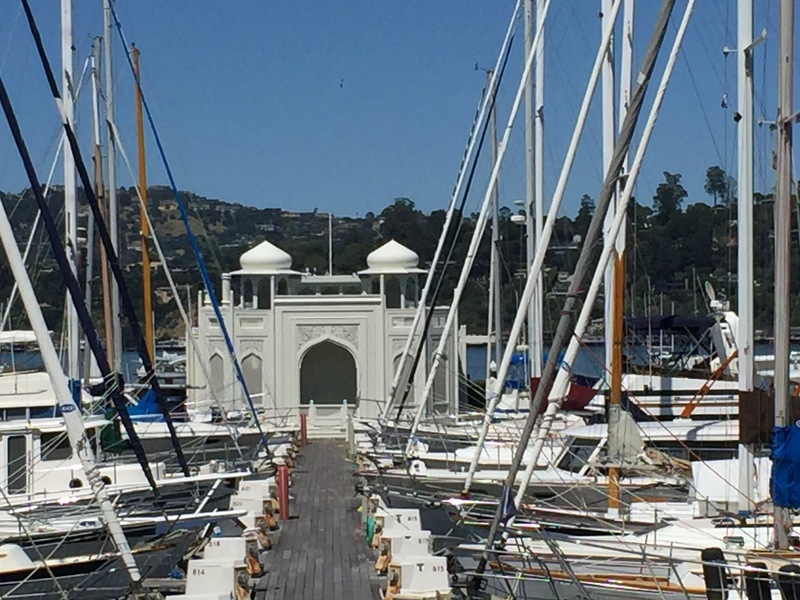 After lunch in Sausalito, we walked the docks. This funky town is known for its crazy houseboats. Yep…that’s a floating Taj Mahal. 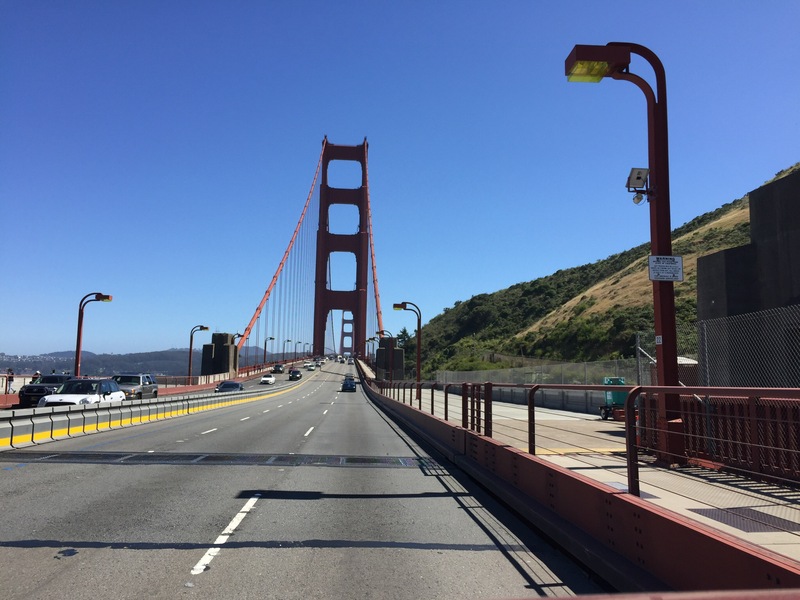 And with a cloudless sky, we couldn’t resist taking a trip across the Golden Gate Bridge! It was a fun way to cap off a really great week with Nancy and David! Next up, a trip up the coast to see the coastal redwoods! In addition, we will reveal the first of our two gigs we have planned for the summer. We are extremely excited to be able to share this with you! Take note that our internet connection and cell service will be spotty at best, so bear with us. Be sure to stay tuned! Sounds like an awesome trip and looks like you hit some unique vineyards and museums!! We drove by Muir a few years ago pre-RV’ing and it was so crowded, we didn’t even stop!! I can 100% verify that you can have a much better Redwood experience in Northern California. Napa and Sonoma was amazing, as was Santa Rosa! We absolutely loved the area. I see you were at our old stompin’ grounds! Looks like you had fun. Hopefully you’ve made it up through the Avenue of the Giants, a lot more trees and less people!! We most definitely did get up there, Bob and Kathrun! We definitely enjoyed Santa Rosa and Napa! You definitely will have to go back, Inger! The story of Anna and Joseph was so sweet. You definitely had an amazing time. Looks like great fun with Gary and all those tours. Those paintings are incredible – really not photos?? The Taj Mahal houseboat is insane :-)))) Looking forward to seeing your redwoods adventure – and finding you at your next stop! Yes indeed! I need to get that next post written soon! Fun time. Love the wines and Sausalito/SF is always a good time! We really enjoyed ourselves, Debbie! It really was. The Pride tour was outstanding also. I know very little about wine but remember touring Christian Brothers old stone and wood carvings everywhere back in 1980. Looks like a good time for you all. Enjoy the northern Redwoods. Thanks for the wine tour. Now we’ll have some new wineries to visit. That sure looked like a fun trip. So many wineries and so little time….. wait…..we do have the time!! Thanks for sharing. We sure do, Sharon! We are looking forward to heading back there someday!